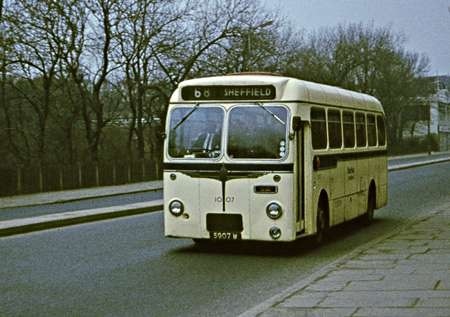 Sheffield Joint Omnibus Committee was an early user of the Leyland Leopard L1 taking six Weymann Fanfare bodied vehicles for the B fleet in 1959 and then five identical for the C fleet in 1960. Later deliveries in 1960 were nine with what I always thought were very attractive Burlingham dual purpose bodies (four for the B fleet and five for the C fleet). The bus in the photo was originally fleet number 1307 renumbered as 1007 in the 1967 renumbering. 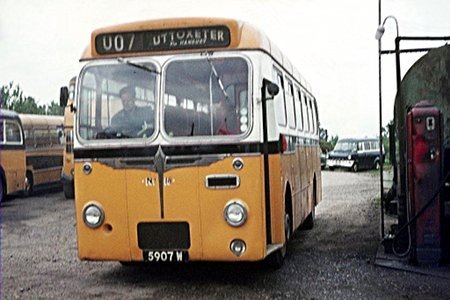 They originally had single piece hinged coach type doors, lever operated from the cab but were modified for OMO with power operated bus doors later in the 1960s. The Leopards were regular performers on the Peak District services and also on the 48 to Manchester. Not many Sheffield buses escaped the scrap man but during 1972 Stevensons of Spath (near Uttoxeter) bought five Leopards from Sheffield, two with Weymann bus bodies, two with Burlingham bodies and a single Weymann Fanfare example. Stevensons fleet number 18 looks very smart here on 29th August 1972 in their yellow and black livery and what a superb registration number!! I always thought it was a nice body, simple and smart. Somehow, it never seemed to make the big time, though, at least not in my part of the world. Could never, as a kid, understand why these were only classified as DP41F, not C41F. Can only assume that it is because the body is basically the Burlingham bus with a Seagull front grafted on. (…..but it is isn’t that much different from the Seagull VI ordered in volume by Ribble). A point to consider, though. Duple took over Burlingham in about 1960 – and the factory continued first with Burlingham designed Duples and then their own designs. Is it too fanciful to think that these were constructed of left over parts, to use them up – rather like the Plaxton 321 some thirty years later, using up Duple 320 parts in a like manner? Over to you, Mr Mercer – esteemed Burlingham guru! Thanks for the compliment David! Burlingham’s standard bus body for underfloor engined chassis first appeared in 1951 and went through various updates until it was discontinued in 1960. The first major change came at the 1956 Commercial Motor Show when the entire front-end was redesigned to give a more modern appearance. To many of us this was the best version of the body and was in production from early 1957 to late 1958. Sales were generally poor by this point (the best known examples of the 1956 design were probably those operated by famous independents such as Clyde Coast and Tor Bus) and at the 1958 Show Burlingham presented the version shown in this photograph. Sheffield’s were among the first production examples and (as far as I know) the only other "big fleet" to buy them was Northern General. As you suggest the window pans were identical to those used on the Mark 6 Seagull as was the lower panel on the front end. I suspect that this was an economy move by Burlingham to standardise on fewer parts. By late 1958 the company was already in dire straits and I’ve heard it suggested by one former employee that all those full-fronted PD3 Titans they built for Ribble were actually delivered at a "below cost" price in a desperate attempt to recover the prestige lost by the later Seagull variants. A classic example of large numbers of units coming off the production line but no money going into the bank in exchange. The obvious parallel is with the early Mini which appeared to be a success but nearly bankrupted its manufacturer. As a regular traveller on these vehicles back in the 1960s I can assure you that the seats were nowhere near as luxurious as those fitted to Seagulls – although much better than those fitted to North Western’s contemporary "Black Tops" which barely qualified as anything other than buses in a really nice colour scheme! I’ve done the trip from Manchester to Sheffield in both types on many occasions and the Burlingham vehicles were perfectly adequate from a comfort point of view whereas NWRCC’s Willowbrook "DPs" were as bottom-numbing as a regular service bus. The livery made us forgive them…. Some of Sheffields Burlingham bodied Leopards also ran for Halifax/Calderdale these being 5875-5879 W The Halifax Dual Purpose livery of cream orange and green gave you the ideal a good bus in an equally good livery! As recorded before, I am a huge Burlingham fan but always defer to Neville’s comprehensive knowledge. (Thank you, as ever.) Such a shame that things bombed out a mere decade after the launch of the Seagull. It is also significant that Manchester bought 50 PD2s and a similar number of CVG6s in 1958 with Burlingham bodywork, at the same time as Ribble’s PD3s, and they were highly regarded vehicles. I have always been rather puzzled about the designation "dual purpose". It seems that it settled down at some point to identify a vehicle with a bus shell and coach seats (or occasionally, possibly, vice versa). But originally it must have meant a vehicle which could equally serve as a bus or a coach. So why exactly is a bus shell more suitable for bus work than a coach shell would be? We have to bear in mind that this started before one-man operation, so it can’t have been anything to do with fare collection equipment. Lancashire United’s DPs of the early 60s were particularly well appointed I remember, more so in fact than the laminate-infested coaches which replaced them. I always preferred the term "service coach". I can think of a number of DPs which were at least as well appointed as some so-called full coaches – often with extremely comfortable seating. ii) Ribble BET Leopards (Marshall, Weymann and Willowbrook) – also seen elsewhere. iii) East Midland RE with full coach seats in bus body. These are probably equivalent to the LUT vehicles and what I think of as DPs – not bus seats in a coach or pretty paintwork (as at North Western). Coach standard of comfort, destination equipment and, latterly, ticket equipment must be the pre-requisites for use on longer or long distance services. Nottingham City Transport had a fleet of Duple Dominants called ‘Lilac Leopards’ which were coach bodies with bus seats. They were examples of the aforementioned Dominant E.
In fact Stevenson’s bought three of the Weymann Fanfare-bodied Leopards from Sheffield – 1500 WJ, 1501 WJ and 1914 WA. And what with two PD3s and a Regent V from the same source, a large chunk of Stevenson’s fleet in the late 70s originated from Sheffield. I took my test with Stevo’s in 1978 and drove most of these buses on school contracts. I have discovered this lurking in my slide collection. 5907 W when still with Sheffield as its 1007, seen leaving Halifax along Skircoat Road and approaching HPT’s Skircoat Garage on the 68 slow stopping service to Sheffield in March 1971. I’ve just caught up with Roger Broughton’s comment on Nottingham’s Lilac Leopards. In fact, Nottingham’s Dominant E vehicles came in two variants. Those painted in the lilac livery, the true ‘Lilac Leopards’, did have coach seats, and were intended for the park and ride services introduced as part of the short lived Zone and Collar traffic management scheme in the city. The idea was that coach seats would help to attract car drivers to the park and ride services. They were never considered to be more than semi-luxury vehicles, so the seats were not to touring specification. There were originally 18, but most were disposed of after the abandonment of the scheme, just 3 remaining as coaches in the fleet, although they were generally to be found on bus services. There were a further 24 Dominant E buses, with essentially the same shell, but less chrome trim and with standard bus seats. These were painted in the reverse version of Nottingham’s green and cream, and were always known as ‘White Leopards’. They appear to have been accorded DP status in fleet lists on the basis of the body being a coach shape, but they were never treated by NCT as anything other than service buses. Thanks for the photo of 1007, John. Interesting to see it with the later Sheffield Transport fleet name after the abolition of the B and C fleets. Didn’t Halifax acquire some of the C fleet batch 5875-5879W about this same time? …..and eagle eyes will see the folding power doors – these were new with full (and heavy) coach doors. Yes, they had all five Ian. 5877-5877 W had passed to Hebble as their 160-162 (soon after renumbered 656-658). They were acquired by Halifax J.O.C as part of the Hebble takeover, and numbered 305-307. 5878/5879 W had passed to Yorkshire Woollen as their 293/294, but were also transferred to H.J.O.C. as part of the Hebble takeover, and numbered 308/309. All passed to Calderdale J.O.C. on its formation at the time of the Todmorden takeover, and were withdrawn in 1972, passing to operators in the Irish Republic.